The Whitewater Main St. Festival committee is sorry to announce, after careful consideration, that the festival will come to an end. The Festival’s mission was to support the arts in Whitewater on a variety of levels and offically began in 2014. Held in the fall it was a fun festival with music, art and craft booths, painting on the streets by festival goers and many hands on activities. The Festival’s founder and main organizer was Deborah Blackwell, director of Studio 84. 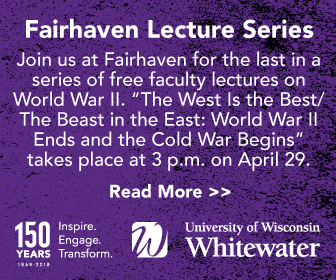 Assisting over the years with its development was Whitewater Arts Alliance, Whitewater Chamber, Downtown Whitewater Inc, UW-Whitewater College of Arts and Communication, and UW-W Student Art Association. Sponsors over the years have included, Dales Bootery, GMA Printing, First Citizens State Bank, Woodland Quilts, K-9 Hair Care, When Pigs Fly, Whitewater Tourism Grant, Nasco Art Supplies, Leaf Filter, Costco Inc and Kraus Dentistry. A special thank you to the many volunteers who helped and to Urban Forestry for the fun hands on bird related activities over the years. From left to right Bob Mertens, Vice President of Whitewater Arts Alliance, Megan Matthews, President of the Arts Alliance, Deborah Blackwell, Studio 84 founder and director, Stuart Nagy, artist from Studio 84. Through its four years of operation, funds raised had grown. In 2018 it was able to award several artistic merit awards at the college and high school levels. 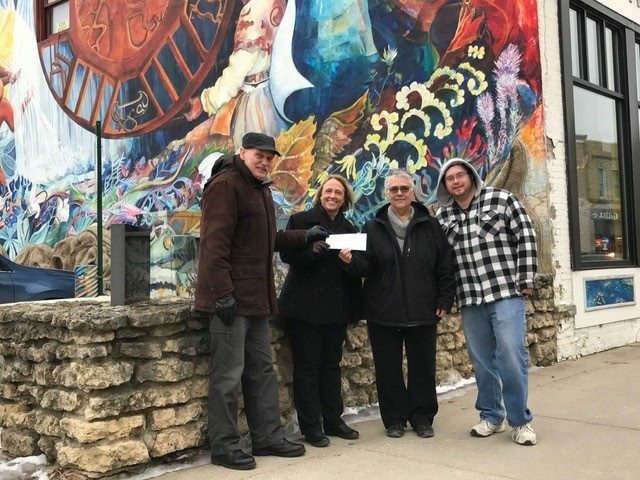 At its closing, the remaining funds, which came to over $2,000, have been donated to the Prairie Tillers Mural Preservation Fund, held and managed by the Whitewater Arts Alliance (www.whitewaterarts.org). The mural is a source of pride, beauty, and history in the community of Whitewater. It is located at 121 W. Center St. on the side wall of the building. Since 2009, the building has been occupied by Studio 84, a non profit community art studio that specializes in the creative development of people with disabilities. (www.studio84inc.org). The Prairie Tillers Mural was originally created in 1980 by artist Caryl Yasko. It is a tribute to the Kettle Moraine. The elements of the mural celebrate the courage and perseverance of our city founders while respecting our unique Kettle Moraine geography with its rolling hills and prairies, and the native Americans who held this land sacred for centuries. The figures on the right side of the mural depict three time periods in history: the tribal era, the early settlers and the people of the present – us – working hard to make history by turning the water wheel to extract the power to build a dream. The figures on the left represent future generations who will take and use what we have to continue the dream. These figures are unformed and undefined to remind us that the future can be shaped by us, by the decisions and choices we make today. The large circle in the center of the composition represents a millwheel. Early Whitewater settlers depended on water power to mill lumber, paper and grain. The first such mill, built by Dr. Trippe in 1839, was in continual use until 1963 and eventually razed in 1972. The wheel is painted with decorative symbols of Whitewater’s accomplishments in agriculture, education, tourism, retail business, manufacturing and milling. The Territorial Oak which still stands at the intersection of Franklin and Main, forms the center of the waterwheel. That great old Burr Oak is the tree from which Whitewater was originally surveyed. Other elements symbolize the land on which this town was built, the waving prairie from delicate spring to flaming autumn. Prairie violet, shooting stars, pasque flowers, blue lupine, prairie smoke, yellow coneflowers, and prairie dock are some of the flowers depicted. The blazing colors of autumn merge into the flames of the annual prairie burnings and the historic fires of Whitewater. With the resurfacing and repainting project of 2004, once again the mural stands ready to greet visitors from around the world and share with them the memories of the past and the hopes for the future.With funds donated by the Main St. Festival and the guardianship of the Arts Alliance, we know the mural will continue being a source of pride and beauty to the community of Whitewater.